Founded in 2013, Shanghai Archaeology Forum (SAF) is a global initiative dedicated to promoting the investigation, protection and utilization of the world’s archaeological resources and heritage. It serves as an international platform for the illumination of archaeological research and its significance and relevance to the world today. The forum is fully committed to excellence through innovation and cooperation, and to the sustainable development of human society. 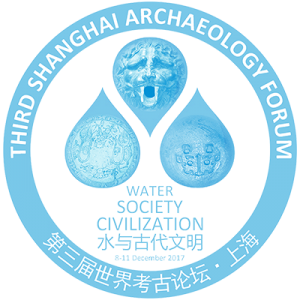 The third Shanghai Archaeology Forum will be held from the 8th through 11th of December 2017 in Shanghai, China, with a central theme of Water, Society and Civilization. From the inception of humankind, water has been essential to human existence and societal development. For millions of years, hunters and gatherers depended on wild animals and plants sustained solely by rainfall before agricultural societies began to develop around 10,000 years ago. The increasingly complicated relationship between water use and food production, social organization, and religious belief led to radical transformations of human societies and their structural dynamics, and witnessed the emergence of urban centers and civilizations all around the world. Water was crucial for the flourishing of all ancient civilizations, whether it was used for daily needs and activities, small or large-scale irrigation or flood protection, water transport, storage and drainage, or for ritual and religious purposes. As urban settlements expanded, the increasing demand for water stimulated a series of significant transformations to manage it, including the invention and widespread use of irrigation and drainage systems, collection and storage facilities, and long-distance water transport technologies. These transformations enabled greater food production that ultimately led to a sustained increase in population size and political complexity. In various places and times, water resources have been used in many ways, from the consumption of drinking water to the ritual use of water, from the construction of state-sponsored water infrastructures to the development of water technologies by local communities, and from the completion of China’s medieval age’s Grand Canal to the building of extraordinary aqueducts by Romans. The extraordinary increase in the demand for water and the sustainability of water resources are among the most challenging global issues of our time. Urbanization, population growth, economic development, political conflicts, and human-induced climate change all contribute to ever-increasing pressure on the planet’s water resources. There is a pressing need to address current and future concerns over water for the fate of humanity. It has been widely recognized that the knowledge of both past and present engagements with water, waterscapes, and their infrastructures is essential to fully understanding the water problems being faced today and their potential solutions. Archaeologists have long recognized the importance of water and its management in the evolution of complex societies and ancient civilizations. Archaeological study of water, waterscapes, water management, sustainable agricultural strategies, and the ritual use and religious importance of water has grown tremendously in recent decades, particularly after Karl Wittfogel proposed his “Oriental Despotism” model of hydraulic civilizations in the 1950s. Archaeological engagement with water in the past may help address key aspects of water and water use in the present as well as the future, especially water scarcity, water-related disasters, and social practices developed by local communities. Such insights are not only limited to general principles or processes but are derived from contextualized local and specific cases and histories. As such, archaeological understanding of water issues past, present, and future is indeed challenging, but the reward is great. (3) to encourage close collaboration between archaeologists and scholars from other disciplines in the investigation of water resources and their management in ancient societies, particularly those issues requiring cross-disciplinary and long-term perspectives.